Ultra Racing New Zealand was established in 2010 and is the Sole New Zealand Importer/Distributor of Ultra Racing Chassis Strengthening products. Ultra Racing NZ is a division of PRO Wholesale and we are based in Tauranga on the East Coast of NZ, we have over 12 years exprience in the Auto Industry specialising in High Quality Performance Auto Products. Ultra Racing braces & bars are becoming well known & more popular due to exposure from a number of high profile NZ drivers sporting the Ultra Racing (UR) brand accross their cars, especially on the drift, track, rally, street and show events, so it time to introduce an Official New Zealand Website. We can also supply other products for your performance vehicle. Ultra Racing is a Malaysian-based specialist manufacturer in Chassis Handling and Tuning components. Ultra Racing research, design, test and manufacture high quality bars for all types of passenger vehicles. Ultra Racing are also the first in thier country to introduce multi-point engine compartment strut braces, which gives superior performance against the conventional strut tower bar. Through intensive research, follows by street and race track testing, bars are proven to provide much improved dynamic safety, ultimate road holding and sensational driving experience. 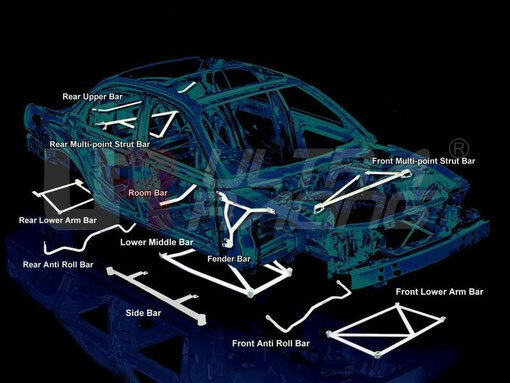 You will find most kind of braces & sway bars for your chassis tuning needs, ranging from Front Strut Braces, Rear Strut Bars, Side Fender Bars Front & Rear Sway Bars to Torsion Bars. All the products are designed for safety and superior handling. This year, Ultra Racing has marked yet another important journey in the growth of the company by winning the prestigious award of Asia Pacific Super Excellent Brand, Books of Record 2007/2008, presented by Asia Entrepreneur Alliance (AEA). This award truly reflects the company reputation and recognition for delivering the best and highest quality products in the Asia Pacific region. Since then Ultra also have picked up a collection of other awards including the GLOBAL BUSINESS MAGAZINE Golden Asia Pacific Top Brand Award 2009/10 and become an ISO 9001 :2008 company in March of this year. Please feel free to browse around our site and we hope you enjoy your stay, let us know if we are able to be of any assistance to you for your project car, show car, street or racing performance vehicle. Street - Drift - Track - Sports - Race - Classics & Family cars are all catered for. Check out the range of Ultra Racing Products available for your vehicle today !